Carson LinenTest 7X Loupe Magnifier - This basic linen tester has a 7X lens. 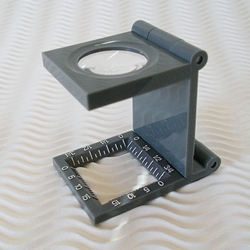 Made from sturdy gray plastic, it folds down flat. When folded, it measures 1-3/4 x 1-3/16 x 9/16 inches.